Experience a VIP exclusive night at SIVA, the UK’s first EDM Residence at Beaufort House! 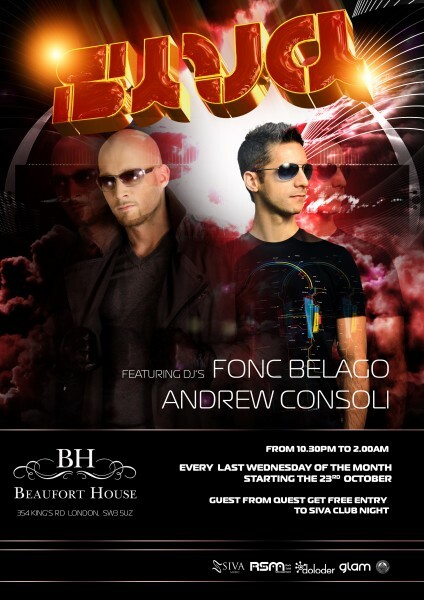 Featuring hot EDM DJs Fonc Belago from Holland and Andrew Consoli from Italy, in the ambience of the Penthouse Champagne bar at Beaufort House every last Wednesday of the month, starting this Wednesday 23rd October 2013 at 10.30pm. Bring some friends and GRAB your FREE entrance tickets for the Hottest Night hitting Chelsea this week. Get your free tickets in advance, jump the queue and avoid the tickets door price of £10.00, by registering for your FREE TICKET via Eventbrite.